Micca makes 1080p video playback affordable with the compact and convenient MPLAY-HD digital media player. 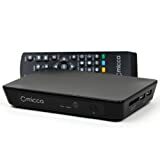 Just connect it to your TV or HDTV as you would a DVD player and enjoy your videos, music, and photos from a USB drive or flash memory card. The MPLAY-HD plays many more video and audio formats than other players on the market. Built on the newest generation Realtek 1055 hardware and software, the MPLAY-HD is simply the most powerful media player in its class. Compare the specifications - don't settle for less!